The RDCK has acquired Campbell Field thanks to a generous donation by the South Slocan Sports Association. 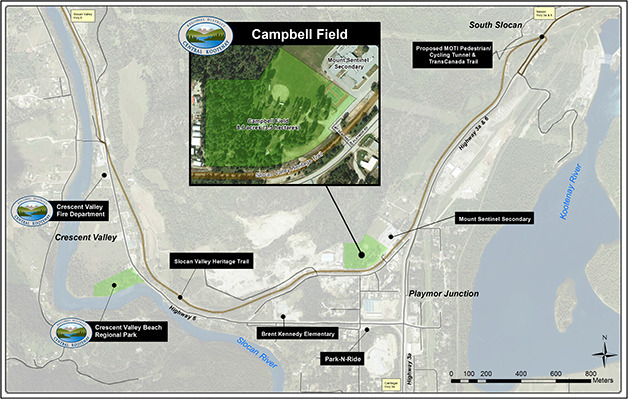 The RDCK has acquired the 8.6 acre parcel of land known as Campbell Field thanks to a generous donation by the South Slocan Sports Association. The property is adjacent to Mount Sentinel secondary school. The property has been administered by the South Slocan Sports Association since the late 1930s, when it was acquired from West Kootenay Power. It’s named after former company president Lorne Campbell. Under the stewardship of long-time Crescent Valley resident and former school board trustee Bob Cunningham, the property has always been used for sports and cultural activities. A covenant ensures the site will always be used for those purposes. The aging membership of the association and the mounting cost of insurance led to the group’s decision to donate the land to the RDCK to ensure the community can enjoy the property for years to come. “We’ve been happy to maintain this pristine land for generations — we played on the field as kids and now our grandkids do, too,” said association president Phil Chernenkoff.